Let me parse these statements briefly. I'll start from saying that I have some environmental credentials. It is enough to read what I have written and publicly said over the last decade or so. I also live what I preach: drive a small diesel car, have rain water on tap, use two lovely donkeys to mow my meadows, and grow my own vegetables. In addition, I do not subscribe to the "drill baby, drill" slogan, which is as silly as the two quotes above. Now back to my main point: North Americans, Dr. Krugman included, are swimming in oil like fish swim in water. There are only a few very small countries on the Earth that use more oil per capita than any of the commentators on Dr. Krugman's piece. 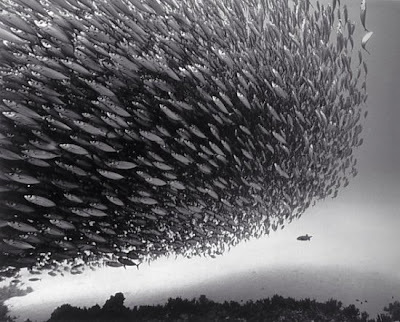 So like the proverbial fish that do not see water and do not register that their noses are wet, most Americans do not notice that crude oil and natural gas have created and are running our economy. A year ago, I wrote The U.S. Fatso on a Miracle Diet of Renewables, where I showed how important hydrocarbons are in the functioning of complex societies. Obviously, very few people read that piece, although it was the most popular entry in my blog for a while. Well, nothing has changed, except that all surplus oil has disappeared from the global markets, and the earthlings are stumbling towards a real shortage of oil and really high fuel prices. Let's imagine now that the bad crude oil and natural gas vanished from our lives overnight. In the morning, three quarters of Americans, after taking a cold shower and eating cold food, wouldn't drive to work or school. I am assuming that these Americans were getting their electricity from coal or uranium, because otherwise their water would not be running from the faucets and food would be rotting in the dark stinking refrigerators. But not to worry, even if these oil-free Americans walked to their job places, there would be nothing for them to do. UPS and FedeX, delivery trucks, ships, and planes would all be grounded. Amazon.com would go out of business overnight. Apple, Inc. would not be able to import those white hot iPhones and iPads from their Chinese sweatshops. The sweatshops would cease production too, because their spare parts would disappear in one day. The liquid crystal displays, motherboards, plastic boxes, and many other parts of the iPhones would become unavailable worldwide. And so on. Do you want me to go over an oil- and gas-free medical care system in the U.S.? I guess not. And how about an absolutely clean pension system and Social Security checks? Let's not go there. Oh, I know, I should perhaps write about food that is not already growing in our gardens and close-by communities - if these communities have seeds and horses or oxen. Let's skip that one too. My all time favorite is Academia that cavalierly presumes it will be able to function and do expensive research in an oil-free world that will also be free of NIH, NSF, BES, DARPA, ARPA-E, and so on. Petroleum engineering departments across the U.S. are the most overworked and understaffed departments in Academia. In my department, the student-to-faculty ratio is 42, and we bring over 1 million of external research dollars per faculty per year. But The U.S. News & World Report does not even bother to rank us with the other, apparently more important departments, such as aerospace, mechanical engineering or chemical engineering. Where would those departments be without crude oil?! Can you imagine jets flying in an oil-free world? Or aerospace departments that work on gliders, while churning those future Lockheed-Martin employees? In summary, my evil oil and gas industry is creating and maintaining all the jobs in our advanced U.S. economy. It takes a Nobel-winning economist to overlook this detail and the dedicated commentariat of the New York Times to vent their hatred of the oil industry, while all are benefiting from crude oil and natural gas every second of their lives. I was kidding. Upon reflection, let's go and buy some of that hot hot Facebook stock and create both jobs, one in India and the other in China. P.S. Hans Rosling in a magic TED's 9 minute talk uses the washing machine allegory to explain what I am talking about here. What can't the lucky few swimmers in crude oil and natural gas understand about how important these fungible, concentrated fuels are? Only six years before, when he (Captain Smith) brought over the brand new Adriatic, he remarked: "I cannot imagine any condition which would cause a ship to founder. I cannot conceive of any vital disaster happening to this vessel. Modern shipbuilding has gone beyond that." I see Captain Smith's arrogance in many of the arguments by Dr. Krugman, Mr. Daniel Yergin, and so many, many others. Their unsinkable Titanic is the U.S. economy. P.S.P.S. 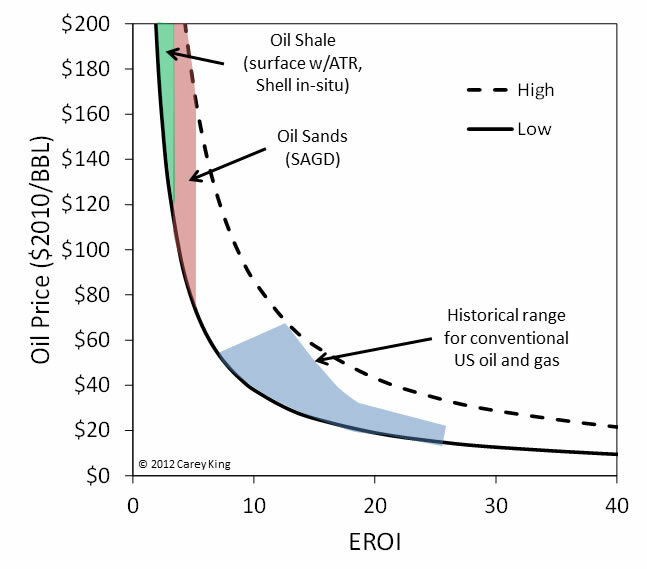 Here is a plot of oil price versus the energy return on investment (EROI). This plot was created by my UT and ASPO colleague, Dr. Carey King. Anyone can see where we are headed. Or can we? I hope this receives a wide audience. The TED link was a great addition. Keep in mind that this is the same Paul Krugman who, in the early 2000's, repeatedly advocated the Fed's artificial lowering of interest rates to spur a housing frenzy. Similar to his incompetent pal, Bernanke, he would later refer to these easily anticipated results euphemistically as "unexpected tail-end effects." He continues along this trend today by advocating Federal spending far beyond our limits. Naturally, if we continue at this rate of spending, the Fed's inflationary policies will result in a massive "burst" when China refuses to rollover on its purchased US Debt. Additionally, I wouldn't look too much into the fact that he has a Nobel Prize in Economics. Today, it is a not-so-subtle pat on the back from Euro-statists for anyone willing to sufficiently preach the values of high taxation and pervasive social welfare programs. Long gone are the days when men like Friedrich Hayek and Milton Friedman received this prize. Today, it's worth less than the gold it's printed on. I tried to contact Dr. Krugman through his academic email and explain the true role of hydrocarbons in a modern economy. There was not reply. 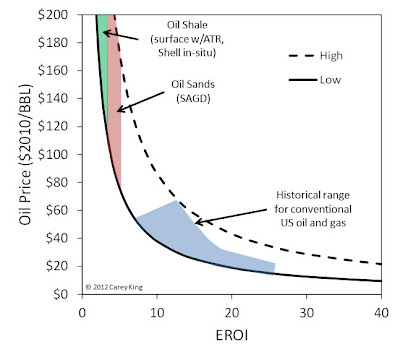 I assume that shale gas and tight oil fall between conventional oil and gas, and oil sands on Carey's graph. It would be nice to see them!